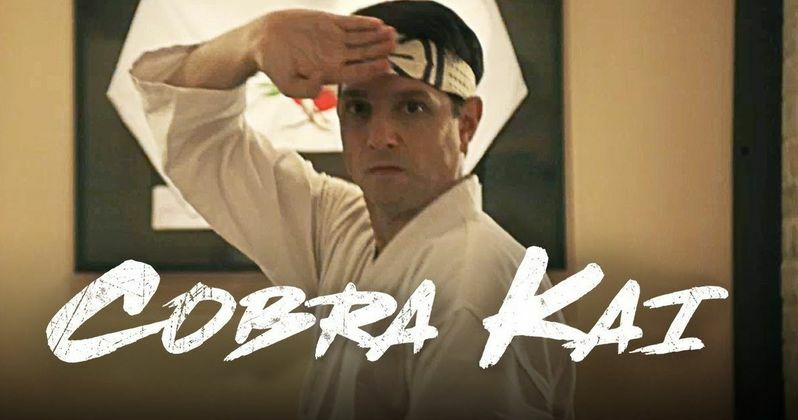 Ralph Macchio's Daniel LaRusso gets the spotlight this time around in the new trailer for YouTube Red's Cobra Kai. The last trailer focused on William Zabka's Johnny Lawrence character reopening the Cobra Kai dojo and training a new motley crew to never show "mercy." Lawrence is down on his luck and takes a bullied high school student under his wing, much like Mr. Miyagi and Daniel-San in the original Karate Kid. Daniel LaRusso on the other hand, seems to have it all, but his nice life is disturbed with the return of the Cobra Kai dojo. The last trailer for Cobra Kai featured a callback to the famous wax on/wax off scene from the Karate Kid and the newest trailer brings back the skeleton costumes with a nervous look from Ralph Macchio's Daniel LaRusso, who is probably scarred for his life after the savage beating he took from the Cobra Kai dojo in the first movie. Elsewhere, LaRusso is seen complaining to his wife about the return of the dojo while they drink wine. The short clip ends with LaRusso and Johnny Lawrence face to face, reigniting their rivalry. In addition to Ralph Macchio and William Zabka, the cast also includes Courtney Henggeler as Amanda, Daniel LaRusso's wife and business partner. She is reportedly the glue that keeps "the LaRusso household and dealership running, and a calming force in Daniel's life." Mary Mouser plays Samantha LaRusso. Xolo Maridueña is Miguel Diaz, who is bullied at his new school, until which leads Johnny Lawrence to take him under his wing. Tanner Buchanan plays Johnny's street-smart son Robby Keene. Robby is trying to prove that he's nothing like his father, but he's already showing signs that he is very similar. Ed Asner is Sid Weinberg, Johnny's tough stepfather who is finished dealing with him. The two latest trailers for Cobra Kai start to let the comedy aspect of the series shine through. This is not going to be like the rest of what we have seen from the Karate Kid franchise, which is refreshing. Ralph Macchio has been hesitant to return to the franchise over the years, but this new treatment was able to get both Macchio and William Zabka excited about jumping on board the new series, which sees their characters sparking up their rivalry again, over 30 years later. Cobra Kai will debut on YouTube Red with 10 episodes that premiere sometime in 2018. There has not been an official release date announced by YouTube at this time, however, an announcement is expected to be made soon. The new series looks pretty awesome and will surely be a hit for Karate Kid fans from all over the world. You can check out both of the latest trailers below and see where Johnny Lawrence and Daniel LaRusso are after growing up and having families, courtesy of the Cobra Kai YouTube channel.